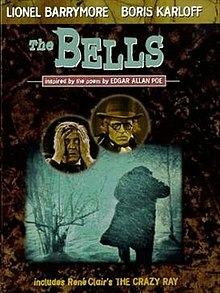 The Bells is a 1926 American crime film directed by James Young, starring Lionel Barrymore and featuring Boris Karloff. The story had been performed on the stage in the 19th century by Sir Henry Irving as The Bells. It was filmed previously as The Bells in 1918 with stage veteran Frank Keenan, and in a sound version, The Bells (1931), which are both considered to be lost films. Footage from The Bells was used in the short films The Mesmerist and Light Is Calling by Bill Morrison. Mathias, an innkeeper with several other businesses, seeks to be burgomaster of a small Austrian hamlet. In order to gain favor with local leaders, he offers food and alcohol on credit, but often refuses to collect, much to the dismay of his wife Catharine. Mathias is deeply in debt to Frantz, who seeks Mathias' businesses. He will forgive the debt if Mathias allows him to marry his daughter, Annette. Mathias refuses, and is worried about the debt which will come due soon. One evening a Polish Jew enters Mathias' inn. The man displays a money belt filled with gold, which Mathias, having had much to drink with the man, eyes closely. When the man leaves in a blizzard, Mathias pursues and kills him; before he dies, the man shakes a set of horse bells at him. Having come into money through murder, Mathias pays off his debt, provides a dowry for his daughter to marry, and is elected burgomaster. However, he is haunted by the sound of bells and hallucinations of the man he killed. The man's brother comes and offers a reward, bringing a "mesmerist" to help find the murderer. Mathias is pursued by the mesmerist and his own guilt throughout the rest of the film. He suffers hallucinations and nightmarish dreams of the murdered man until the final reel, in which he confesses his crime aloud to the ghost, then collapses, dead. ^ "Progressive Silent Film List: The Bells". Silent Era. Retrieved April 12, 2008. This page was last edited on 27 January 2019, at 09:48 (UTC).